Hold Me Bags are available in three sizes: The Hold Me Bag (largest), The Hold Me Middle Sister Bag (medium), The Hold Me Baby Bag (smallest). 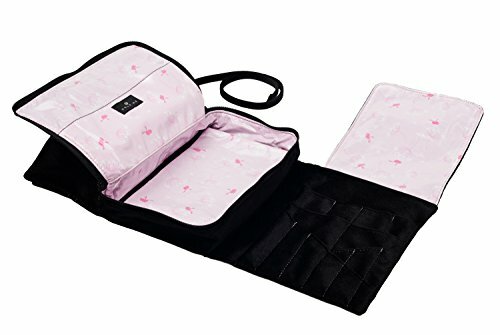 This is the HOLD ME BAG, the original and largest bag for makeup lovers having large brush collections and a large assortment of cosmetics. It measures 10"H x 7"W x 2.5"D closed; extends to 22" fully opened. This bag features an exterior made from soft Black Velvet fabric that has excellent shape retention and is soft to the touch. Interior highlights of cotton fabric with a washable overlay. Both are easy care, as even the most stubborn make-up traces are easily wiped away. Patented design. Made in the USA. If you have any questions about this product by Hold Me Bag, contact us by completing and submitting the form below. If you are looking for a specif part number, please include it with your message.